Reading in Between the Life… – …because life is where the real learning takes place. It was the end of the day, so I asked her to let me think about it in the hopes that she would forget to come back to me and follow up. Thankfully, it seems she forgot, but I didn’t forget and her question made me consider the various romance tropes to be found in classical literature. Emma (1815). The titular character and heroine Emma meddles in everyone else’s affairs, offering bungling them while remaining clueless to the chaos she’s left in her wake. Mr. Knightley, the only sane man in the room and Emma’s eventual husband, is always there to set her straight and bring her back down to earth. I have a particular fondness for Mr. Knightley. Sense and Sensibility (1811). This is one isn’t readily included in this trope because Elinor and Edward clearly forge an emotional bond early in the novel. However, it is clear that they are also good friends, and Edward was engaged to another woman initially before eventually being freed to marry Elinor. Mansfield Park (1814): In the midst of a story replete with broken hearts, infidelities, and all around awfulness, Fanny Price and Edmund Bertram, her cousin by marriage, eventually recognize how important they are to each other and get married. Pride and Prejudice (1813): Lizzy initially finds Mr. Darcy pompous, then evil, and eventually realizes that the tallest, handsomest, and richest man around is the perfect man for her. Persuasion (1817): Having -under family duress- broken her engagement to Frederick Wentworth seven years earlier, the novel opens 7 year later with Anne Elliot still unmarried at 27, and the much wealthier and more established Captain Wentworth is also still unmarried. His love for Anne is as fervent as it was when they were young. After the customary dramatic twists and turns, they end up together. Pride and Prejudice: I suspect the marriage of Charlotte Lucas to the obnoxious and offensive Mr. Collins was the impetus of the question posed to me by the young student. Sense and Sensibility: Marianne Dashwood landed quite a catch in Colonel Brandon, but should the story have continued, it would have been a few years before she fully appreciated it. Sense and Sensibility: Colonel Brandon and Marianne Dashwood are ages 37 and 19 respectively when they eventually marry. Mr. Knightley and Emma are ages 37 and 21 when they are wed. Pride and Prejudice (1813): The foolish and rebellious Lydia Bennett runs off with the caddish and opportunistic Mr. Wickham, leaving Mr. Darcy to try and save her honor by paying Wickham a large dowry to marry Lydia. Sense and Sensibility: Before coming to her senses and marrying Colonel Brandon, Marianne Dashwood foolishly gives her heart to Mr. Willoughby, and spend the lion’s share of the novel pining a man who is never going to marry her. Those are just a few of the major tropes that spring to mind as I consider all that is encompassed in Jane Austen’s magnificent body of work. There are of course, many more; unrequited love, redemption, and whatever it is called when a man thinks a woman can save him as Henry Crawford seems to think that Fanny Price will do for him in Mansfield Park. Can you think of any other Austen tropes which I might have missed? Digital respites are almost always excellent opportunities for more reading. Of course, that’s not the only thing a digital respite frees up time for. The list is endless. There’s increased cleaning time, increased exercise time, and increased home improvement time. The latter also includes increased spending, but more about that later. One of the most notable changes that come with reduced mental noise is the ability to think unfettered. When reading great ideas and grand classic fiction, the abiity to step away in quietness and analyze what was read helped me to better flesh out the nuances in the books I was reading. I wanted to chat with others about what I was reading, and having deliberately closed the door to being able to do that here, those conversations took on a larger role during times with friends. At the end of March, after weeks of sharing different ideas from Cal Newport’s Digital Minimalism, I handed my copy to a friend who was interested in reading it. When she gave it back to me last week, I immediately took it from her and handed it to another friend of ours who’d been wanting to read it as well. It was such a satisfying moment, the ability to bond and share ideas which emerged from the things we read. This is, without question, the best part about increased reading time: the opportunity to talk about books with friends. Even better than that is when we have the opportunity to share not only what we have read with friends, but share the books themselves. As I have handed friends -and taken from the hands of friends- books of every era and genre, my commitment has steadily increased to physical books over digital. I thoroughly appreciate the ease and convenience of both digital and audio books. I have a loaded Kindle and am currently listening -albeit very slowly- to The Brothers Karamazov. The wealth of digital book option is a boon to the bibliophile. However, they can’t compare with the joy of passing tomes between friends and dissecting the ideas over cups of coffee. I’m considering the idea of a summer book club because spending time chatting with girlfriends and fellow mothers about books is infinitely more edifying than complaining or gossip. I am blessed to be in community with women who don’t engage in the latter anyway. We went ahead and started hanging some of the garments because nearly 3 months of clothes stacked across the desk in our bedroom was more than long enough. Public service announcement: Never start a major home project at nearly the exact same time as you’re beginnng a new, relatively demanding job. 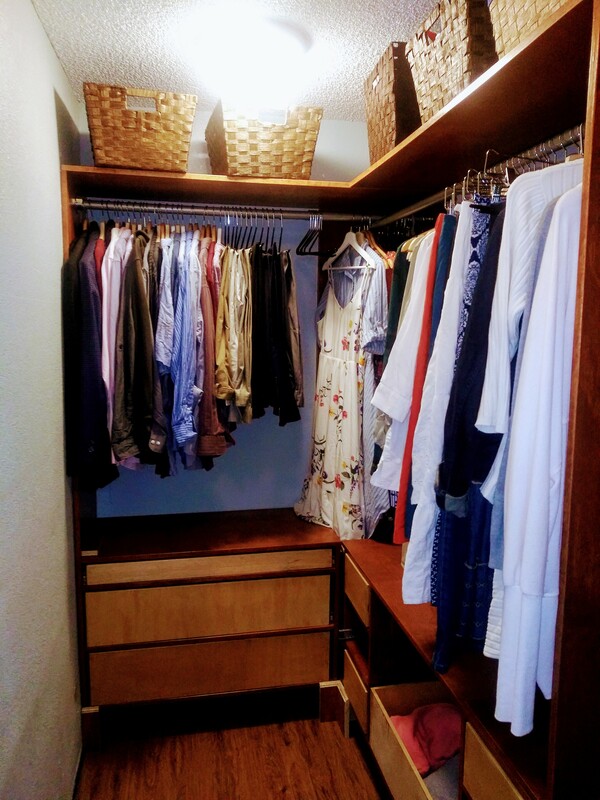 Respite, feasts, worship, family, (and extra closet space!) are the stuff of life. But what is any of it without great books? Bread and Wine: Readings for Lent and Easter. Various authors. Published in 2003. Hardcover, 430 pages. In addition to some Scriptural passages, I decided this year to add this devotional to my Lenten readings. In many ways, it was a great blessing to me. Many of the writings challenged and stretched my faith in unexpected ways. Conversely, there were other readings that felt needlessly preachy and even social justice-y, for want of better phrasing at present. One reading which was staunchly anti-gun rendered me particularly confused. Thankfully, the readings of this sort were a minority, but when they came up, it was a distraction which I had to pray to overcome. If the book was dominated with such writings, I would have abandoned it. However, the reminders of the importance of self-denial, as expressed by the poetic and convicting pens of such writers as Dietrich Bonhoeffer, C.S. Lewis and St. Augustine kept me returning to this book to be challenged further. Because it is so theologically inclusive, I wouldn’t recommend it to anyone who isn’t well versed in the Scripture with a strong grasp of their Christian faith. There are also times when the new Christian might read and find a bar so high she fears she will never reach it. I welcome the opportunity for honest examination of the motives of my heart, but I am also mature enough to understand that the expressions of faithfulness as described in many of the readings can leave the impression that our efforts must always manifest a perfection of spirit and self-denial (as in denial of our humanity not denial of our will) that is nigh impossible to achieve this side of heaven. I am grateful for what I read, and look forward to reading many of these writings again, while knowing that many of them are less than stellar. Leisure: The Basis of Culture, by Josef Pieper. Originally published in 1952. 145 pages. One of the most important philosophy titles published in the twentieth century, Josef Pieper’s Leisure: the Basis of Culture is more significant, even more crucial, today than it was when it first appeared fifty years ago. Pieper shows that the Greeks understood and valued leisure, as did the medieval Europeans. He points out that religion can be born only in leisure – a leisure that allows time for the contemplation of the nature of God. Leisure has been, and always will be, the first foundation of any culture. He maintains that our bourgeois world of total labor has vanquished leisure, and issues a startling warning: Unless we regain the art of silence and insight, the ability for nonactivity, unless we substitute true leisure for our hectic amusements, we will destroy our culture – and ourselves. These astonishing essays contradict all our pragmatic and puritanical conceptions about labor and leisure; Josef Pieper demolishes the twentieth-century cult of “work” as he predicts its destructive consequences. This is book is a collection of essays exploring the meaning, significance, and implications of leisure on the soul of a culture. As I read it, I needed to keep that in the forefront of my mind. Rather than each chapter building upon the one prior, many of the ideas in the various essays overlapped. Once I was able to adjust to that, it was much more engaging and enjoyable to me. I was inspired on many levels as I read it. At first glance I questioned whether or not our culture, which seems thoroughly obsessed with being entertained, could ever be described as “leisure-less”. However, as I continued to read Pieper’s understanding and definition of leisure based on historical writings and philosophies, the situation became clearer. More than culture on a constant search for leisure, we are most accurately described as one in the grip of a sort of acedia; chiefly characterized by spiritual apathy and mental sloth. Given our recent discussion here on the reality of leisure as something other than idleness or physical rest, having the added building block of Josef Pieper’s insights about the effects of leisure on the soul was an welcome addition. Note: Beginning tomorrow (3/6/2019), I will be logged out of WordPress until at least 4/22/2019. It is my sincere prayer and desire that those of you who commemorate the Lenten and Easter seasons have blessed, worshipful celebrations. Discrimination and Disparities, by Dr. Thomas Sowell, Kindle edition. Originally published March, 2018. 143 print pages. Thomas Sowell, among the most brilliant economist and political commentators of our time, was the first voice that resonated with me as I began to formulate my own thoughts about how the world works. His work helped me to intelligently process which policy ideas were worthwhile and which are actually destructive to society. For the first few years of my adult life, I had accepted a lot of things at face value which turned out, under closer scrutiny in the light of facts, to be fallacious at best, but mostly just ridiculous and dangerous. This book is particularly exciting for me to share because it is exactly the book I would recommend to anyone who is unfamiliar with Dr. Sowell’s work. Having read many of his books, I can attest that his work is not light reading. You must approach it attentively and prepared to be confronted with boatloads of facts. Dr. Sowell bombards his readers with so much documented research that thinking is required to read his books. What can we conclude from all these examples of highly skewed distributions of outcomes around the world? Neither in nature nor among human beings are either equal or randomly distributed outcomes automatic. On the contrary, grossly unequal distributions of outcomes are common, both in nature and among people, in circumstances where neither genes nor discrimination are involved. What seems a tenable conclusion is that, as economic historian David S. Landes put it, “The world has never been a level playing field.” The idea that it would be a level playing field, if it were not for either genes or discrimination, is a preconception in defiance of both logic and facts. You really need to read the entire book to fully appreciate the wealth of insight in that quote. This is especially true in our world where people are so highly invested in their personal narratives of why the world is the way it is. Whether it is those who insist we can legislate our way to equal distribution of outcomes which are mostly a result of overt, hostile discrimination, or those whose haughty belief in their own superiority cause them to genuinely believe that entire races of people are inferior to other entire races of people, Sowell puts both assertions on the chopping block. Using solid facts and evidence as the ax, both erroneous assumptions lose their heads. The cool thing about this book, besides its detached and factual approach to a sensitive subject, is that the notes section is extensive. In fact, a full 1/4 of the book is encompassed with notes and research references. In other words, Dr. Sowell doesn’t simply offer up his clear belief that most inequality of outcomes can be easily directed to causes other than racial, sexual, or class discrimination. He backs it up with facts, then backs up those facts with even more facts. If you’ve never read Sowell, or tried and gave up under the weight of his intellectual style and overwhelming factual record, this short book is an excellent read to get the gist of why this man is so well respected as a giant in the intersection of economics and political policy. Or why he is so hated by those who prefer that we just make decisions based on whatever makes us feel as if we’re good people. Thomas Sowell Invites Us to Think. I am currently reading Thomas Sowell’s latest release, Discrimination and Disparities. I feel completely comfortable saying that Dr. Sowell is one of the greatest economic and political commentators of the 21st century. He has an unrelenting commitment to the truth and his insistence on looking at the logical conclusion of ideas makes him a rare breed among commentators of the day. The fact that a thing sounds good, compassionate, or helpful must -according to Sowell, and I agree- be held up against empirical, factual information to determine if it is indeed going to produce the results promised. Usually, utopian intentions turn out to be little more than a Super Highway to Hell (I ripped that from Sowell). As is my custom, I am currently reading two books of vastly different genres and topics. Despite knowing that it makes for a much longer reading time on both, I continue to to do it anyway.Thankfully, that is not all I am currently reading. It is commonly known by regular readers here that I am great admirer of both Joshua Gibbs of Circe Institute and Cal Newport’s blog, Study Hacks. Both have offered mentally stimulating food for thought in recent posts, so I thought I would share portions of them here in the optimistic belief that you will be intrigued enough to click over and read the articles in their entirety. Parent: I wanted to tell you that I read this really amazing book by John Piper recently and it blessed me so much that I thought I should tell you about it. I think it would be a great fit in the school’s theology curriculum. Dean: I am sure the book is quite good, but given that John Piper is still alive, the book does not meet the basic criteria which this school uses for admitting new titles into the curriculum. Parent: What criteria would that be? Dean: For starters, curriculum books ought to be old. Dean: It is best if the author has been dead for a hundred years. Parent: Why a hundred years? Dean: After a hundred years, it is safe to assume no living person ever met the author. If the author is still considered worth reading after he has been dead for a hundred years, it means he speaks from the grave. It means there is something immortal about his wisdom, something divine. Parent: I know the book I am recommending was written recently, but it is good and true. Don’t classicists care about truth, beauty, and goodness? If so, does it really matter how old a good thing is? Dean: Yes. Classicists do not simply care about the truth, beauty, and goodness of a book, they also care about who is claiming the book is true, beautiful, and good. Classicists are not content to trust their own judgments, but act in harmony with the judgments of their ancestors. We might judge a recently published work of theology to be good, but that judgment could not be made in harmony with our ancestors, because our ancestors never read the book. You can see how the conversation unfolds by reading the entire post here. Fry was instead correctly noting that meditation is an unnatural solution to a modern problem. Meditation helps, but it doesn’t solve the underlying issues . What, Fry seems to be asking, is the cognitive equivalent of the natural behaviors like exercising and healthy eating that our species used to enjoy but are now missing in modern life? I’m not the first to ask this question, and many people have proposed compelling answers (see, for example, Mark Sisson and John J. Ratey). But something that became increasingly clear to me as I was researching Digital Minimalism, and the reason why I’m bringing up this topic in the first place, is that in recent years, our relationship with our screens has almost certainly exasperated this modern separation from a more natural way of living . I hope you all find these as intellectually provoking as I did. More book reviews are coming soon!